I was gifted some of these products and wanted to share my love for them with you all. As always all thoughts and opinions are 100% my own. I wanted to pull together a bunch of gifts that are MUSTS. We either used them and swear by them or they came out after Izzy was too old and I WISH we had them. So here we go, the baby shower gift guide. Items beyond the bottles… things you may not have heard about that are equally awesome and must haves! These super and I mean super soft covers can be worn as a scarf when not in use. The cover can be used as a shopping cart cover, nursing cover or carseat cover. I mean heck you can even use it as a highchair cover. When Izzy was young I always covered her highchair when out to eat. There are multiple fabric choices. Your mama friend will be thankful you got this useful 3 in 1 cover for them. 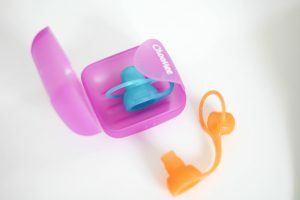 From baby food to toddler applesauce on the go or at home… we LOVE ChooMee products! 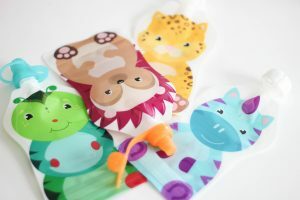 We love the reusable pouches! I still give Izzy applesauce in them. I use to freeze her applesauce or baby food and them bring them with us. If they were not quite thawed enough I would run the, under warm water in a bathroom. The sip’n covers help keep the pouch contents from spilling everywhere. I even sometimes get pre made applesauce. I pack it with the pouch and sip’n cover so I can pour it into the pouch while we are running errands or out to eat. The dip’n spoons are great for grabbing early foods like yogurt, applesauce etc. A monitor is a must and I LOVE seeing what Izzy is up to. 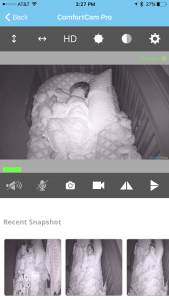 Especially now that she is in toddler bed, I like that I have the option to scan the room with her monitor. When she decides to sneak out of bed. This monitor comes with an app and it’s super easy to use! I love the fact I can take images of Izzy and save them in my gallery. If you watch my Instagram stories on @busylittleizzy then you see these often. 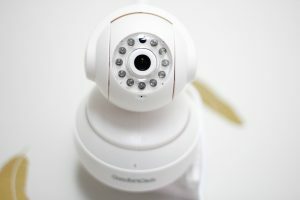 You can hear and talk to your child through the monitor as well. We got this monitor later on, after Izzy was a year old. I wish we had it from the beginning though.. and that’s why I’m sharing it with you. Disclaimer, Izzy is no longer a baby. She’s 2 1/2 and therefore has pillows, blankets and stuffed animals in her bed. I’m obsessed with these products. 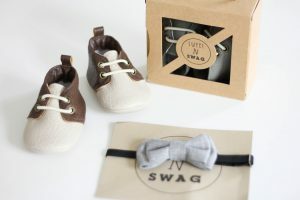 They use to just have moccasins but recently explained to moxfords (shown below), bow ties, headbands and more! The soft soles are perfect for crawlers and beginning walkers. As your child becomes more of a pro add on the rubber sole to give extra protection as they walk. 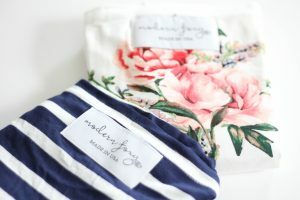 How could you not have these darling pieces on your registry or in your shower gift to an expecting mom? Izzy and I have been wearing this chewelry for a long time! 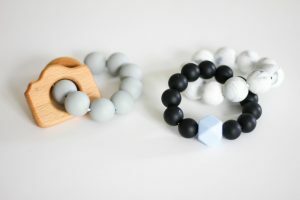 Chewelry = jewelry that your babe can chew. Now as a toddler Izzy wears her own necklaces and when she’s getting a tooth chomps away. It’s great redirection for when she tried to put something in her mouth or for kids who bite. You can direct them to bite their chewelry. Beyond this they come in adorable patterns and also make a Zen sack. We didn’t have this with Izzy but I wish we did because I know many mommies who say it’s amazing! Izzy is wearing a Getting Sew Crafty necklace, holding Sweet N Swag moccs and I’m putting a Nested Bean swaddle in the gift bag. These blankets are amazing! They came out right after Izzy was born so we just missed them. I’m so bummed too because they are so fun! 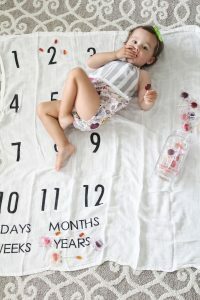 Keeping milestones on a blanket is fun and allows you to get really creative. We didn’t have these with Izzy but I sure wish we did. The creative juices are flowing! How fun is this little shot of Izzy? Hi I’m Izzy, I’m two years old and I live for gummies and pops. This is what I mean, you can get super creative and have a lot of fun with it! 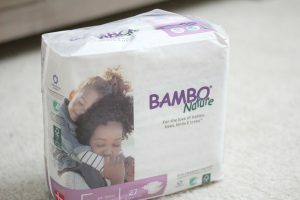 We LOVE Bambo Nature diapers. I wish I could say I’ve been using them since she was born, but I haven’t. I didn’t even know about them. They are by far the softest eco-friendly and dermatologically tested diapers I’ve tried for Izzy. We are hooked and now we are lucky enough to be partners with Bambo Nature. 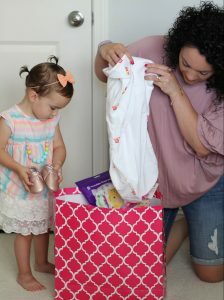 If you are looking for diapers that are safe on your baby and the environment, these are the ones you should get! 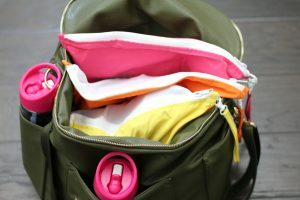 These bags are the BEST organizers for your diaper bag, tote, purse, travel bag and more! I’m obsessed and all my friends who I urge to get them.. they love them too! 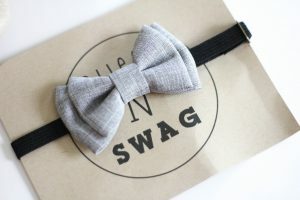 They also come in different colors so you can easily know what you are pulling out of the bag based on the color bag. 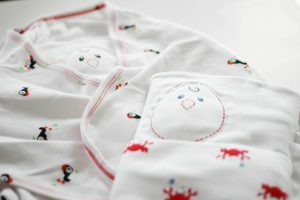 Keep a chance of clothes in one, snacks & bibs in another, toys and teethers in another etc. Previous Post Maine Eats ~ Portland Pie Co. So many good gifts! I especially loved those sweet n swag shoes. adorable! This is such a great round up! Love those Modern Foxy covers! 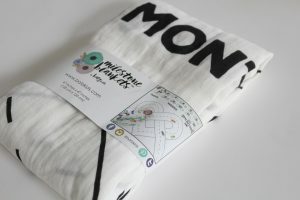 I love the milestone blankets! Wish we had those when my son was a baby. I know same here! Aren’t they so fun? Great ideas! And those little pouches are the best! So many great picks! I love those modern foxy covers! I have to go to a baby shower next month and I think I’m gonna get that blanket as a gift! Oh, this is a perfect round up! I wish I’d had one of those video monitors when my little sleep apnea boys were younger!! what amazing options! I wish I had a baby shower to attend now! So many great ideas!! We used many of these my last time around!